This is the Envince theme instruction page. We have tried our best to keep it as simple as possible. If you think it can be made even simpler let us know we will be glad to change it. Let’s start! On the left side you can see the table of contents of this documentation. Jump to the section you want, or read it all through – your choice. Let’s move on! Installing your theme is pretty easy! After downloading you should have a envince.zip file. This is a compressed file containing all of the required templates and images required for the theme to function properly. By default, you will be asked to create a menu if you are logged in else it will show the empty menu. So, you might need to create a menu and assign it to the primary location. This option provides you whether to display the Site title or not in your site. This option provides you whether to display the Site tagline or not in your site. This option enables you to upload the header logo in your site, making your site brand look unique by using the custom image. This theme supports the color options for the header text and background. This theme also have the option of primary color so that you do not need to change the primary color in your site one by one. This theme supports for changing of the primary color of your site according to your site need. This theme supports different layout option to be choosed from to best suit your site. From this option, you can have the number of footer sidebar area according to the requirement of your site. This theme supports the header info bar to add the phone number, email and location. This theme supports the category color options as required for your site to display the category of post in beautiful colors. Now choose the required color for each of the category here according to your site need. This theme supports the option of having the Custom CSS Box so that you may tweak some small CSS adjustments in your site without having to create the child theme for those. Now write the required CSS code here to overwrite the theme as well as plugins CSS code. This theme has built in page templates to show your post post in different way by using the bundled widgets. This theme has different widgets being built in it to display the post of your site in different way. Create posts, assign categories and add featured image. Add the TG: Featured Post Slider widget to the Pagebuilder area and select category and number of posts. 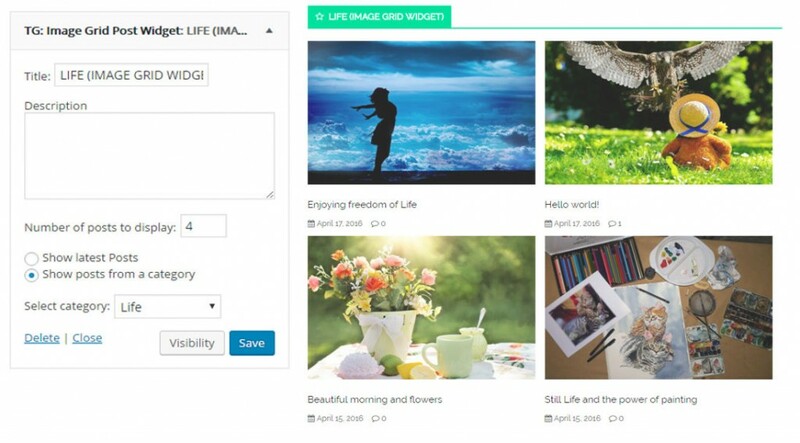 Add the TG: Image Grid Post Widget to the Pagebuilder area and select category and number of posts. Add the TG: One Column Featured Post Widget to the Pagebuilder area and select category and number of posts. 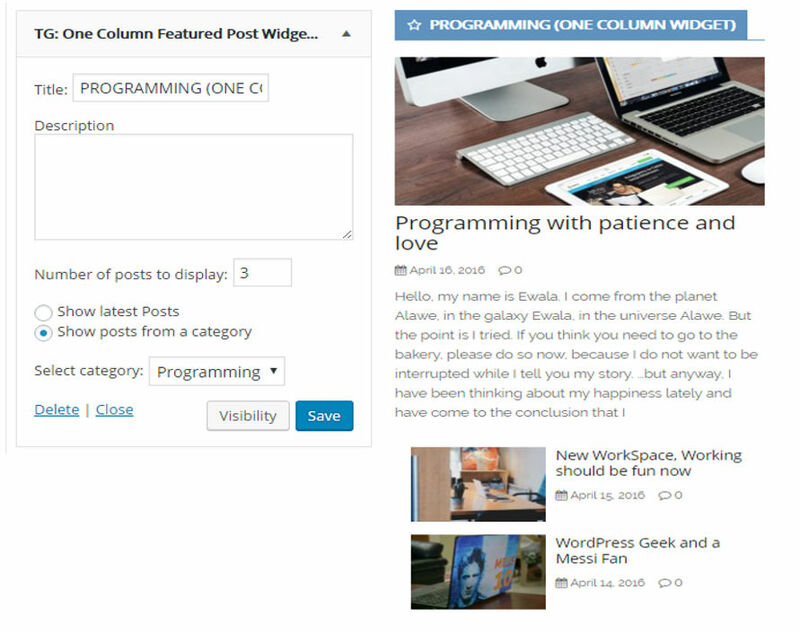 Add the TG: Two Column Featured Post Widget to the Pagebuilder area and select category and number of posts. It is the widget bundled in this theme which will be used as displaying the advertisement in your site by using the image. Add the TG: Advertisement to the Pagebuilder area and select category and number of posts. Create posts, assign categories, add featured image and all necessary filds of Product Review. Add the WPC Top Product Widget to the Pagebuilder area and select category and number of posts. Info: need to install WP Product Review plugins. Add the TG: News Ticker Widget to the Pagebuilder area and select category and number of posts. Add the TG: Single Post Slider Widget to the Pagebuilder area and select category and number of posts. Add the TG: Post Carousel Widget to the Pagebuilder area and select category and number of posts. Create event posts, assign time & date, location, organizers, event costs and add featured image. Add the TG: Events Slider to the Pagebuilder area and select number of events posts to display. Info: need to install The Events Calendar plugins. Add the TG: Post List Widget to the Pagebuilder area and select category and number of posts.